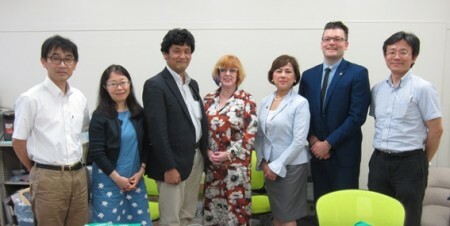 On June 20, 2016, Dr. Katy Campbell, Dean, Ms. Mimi Hui, Executive Director of Administration & External Relations, and Mr. Mark Bell, Program Coordinator of Seminars & Events of the Faculty of Extension, University of Alberta, visited Kumamoto University(KU) and met with Professor Kazuki Takashima, Vice President for International Affairs, and Professor Tsuyoshi Usagawa, Dean of the Faculty of Engineering / Advanced Science and Technology and Graduate School of Science and Technology. Since the signing of an academic exchange agreement in 2001, we have deepened our relationship with the University of Alberta in various ways, such as inviting researchers and faculty members from and sending ours to the university, and sending our students to participate in the English and Cultural Seminar at the University of Alberta. During this meeting, not only did KU introduce the College of Cross-Cultural and Multidisciplinary Studies to the delegates, but also the two universities shared each other’s thoughts about ongoing and future exchange programs and agreed to further promote friendly relations. 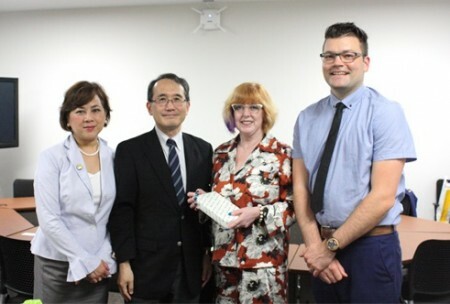 On the same day, a presentation session was held to introduce the University of Alberta. 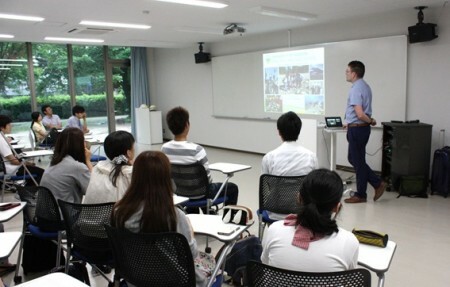 Many of the students who are interested in the university attended this session. The College of Cross-Cultural and Multidisciplinary Studies and Faculty of Letters Cultural Anthropology Laboratory of Kumamoto University have launched Kumamoto Anthropology Film Society (KAFS). The first event by KAFS will take place as followings. 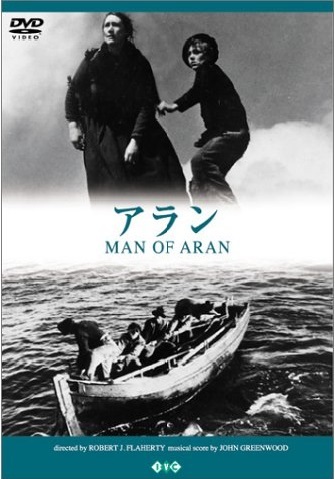 At the first gathering of KAFS, we will show the classic movie in ethnographic film, “Man of Aran”, 1934, English, 73 minutes of Robert Flaherty. Partial scenes from “Nanook of the far north” of the same director (Nanook of the north, 1992, English 78 minutes) will also be shown in the session. There will also be a session by Joshua Rickard Ph.D. and Professor Katsuhiko Keida. Please look forward to the event. There is no need to make reservations, people who are not affiliated with Kumamoto University are also welcome. We look forward to sharing good films and discussions with you!